President Akufo-Addo has assured the people of Ghana and the private sector that his Government will continue to work to create a stable economic framework and a positive outlook for businesses. The President explained that a new fiscal rule, which caps the fiscal deficit at a maximum of 5%, and ensures a debt-to-GDP ratio of a maximum of 65%, has been enacted. President Akufo-Addo made this known on Tuesday, 15th January 2019, when he commissioned a biomass boiler, a personal care dryer, and an oral care factory of Unilever Ghana Ltd., in Tema. “Unilever has become a household name in Ghana, with millions and millions of Ghanaians, on a daily basis, using products the company manufactures here in our country. 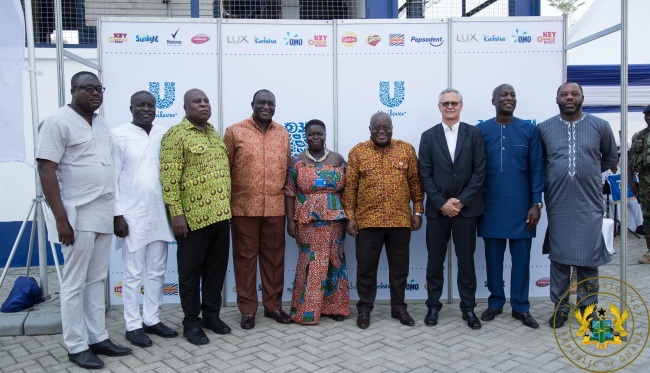 On behalf of the Ghanaian people and their government, I express the appreciation of the nation to Unilever Ghana Ltd for its many years of service to the growth of our nation,” he added. Whilst acknowledging that the ability of Government to create jobs on its own is limited, President Akufo-Addo reiterated his belief that the responsibility of creating jobs is primarily the responsibility of the private sector, with the active support of the government. “The government I lead is a natural cheerleader for the private sector, and it is my sincere wish that Unilever, and, indeed, the Ghanaian private sector will take advantage of the growing business-friendly climate in the country to invest further in Ghana. Cascading investments in our economy is the most effective way to expand and strengthen it in order to create the many jobs our young people so ardently want. It will happen, and soon,” President Akufo-Addo assured.